What is known about the arrested men Jump to media player The head of Russia's security service has said that two suspects have been arrested in connection with the killing of the opposition politician Boris Nemtsov. 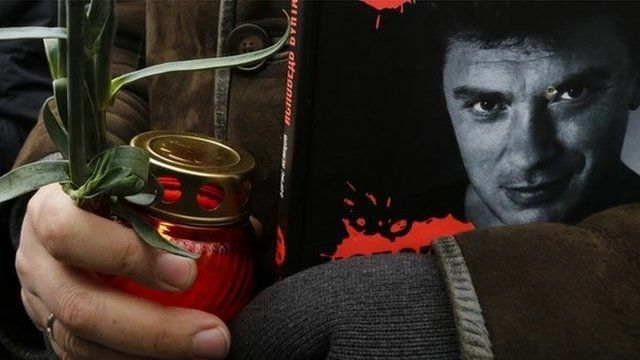 Nemtsov 'shot in the back' Jump to media player People have gathered in Moscow to pay tribute to opposition leader Boris Nemtsov, who was shot dead on Friday just meters from the Kremlin. The head of Russia's security service has said that two suspects have been arrested in connection with the killing of the opposition politician Boris Nemtsov. A prominent critic of President Vladimir Putin, Mr Nemtsov, 55, was shot dead in Moscow eight days ago. Sarah Rainsford reports from Moscow.